Ruel studied at the University of British Columbia in 2005, majoring in Classical Guitar Performance with a minor in Composition. His B. Mus. degree was conferred in 2008, the same year he produced and performed on the Allegra Trio’s album, “East-West Journey”. Ruel’s foray into music began with piano lessons at the age of four with The Royal Conservatory of Music. Ten years later, Ruel taught himself how to play the guitar, exploring rock and metal genres. With the start of his first formal training at Kwantlen Polytechnic University in 2003, Ruel began his venture into classical music and jazz. At the same time he joined the Percussion section in the KUC Wind Ensemble. The following year he became Principal Percussionist. Eager to express himself not only within the confines of academia, Ruel was a guitarist and songwriter for his former progressive rock group, Drasis, which released their self-titled EP in 2005. At the same time Ruel studied under the world renowned drummer – Ryan Van Poederooyen of Devin Townsend Project to further develop his progressive drumming techniques and approaches. 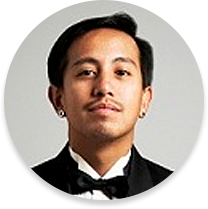 Currently, Ruel resides in Vancouver, BC, where he works as a performer, instructor and composer. His latest work is entitled, “Christmas on a Solo Guitar” available on iTunes.